The story of Robert and John Hazeltine should probably start with the Reverend Ezekiel Rogers, who was to play a large role in their future as well as many others who came to the Massachusetts Bay Colony. Ezekiel was a radical puritan minister in England. The Church seems to have been a family calling. His father Richard, brother Daniel and cousin Nathaniel Rogers were all ministers. After graduating from Christ College Cambridge University in 1608 Ezekiel became Chaplain to Sir Francis Barrington of Hatfield Broad Oak in Suffolk. Sir Francis was very wealthy and was able to procure for Ezekiel the living of St. Peter's in Rowley, Yorkshire in February of 1620. In 1638, the village was very small, but parishioners would travel from nearby villages to the church for services. Ezekiel's career ended, as did many other puritan ministers, because he refused to read from "The Book of Sports". This book, first written by James I of England in 1617, was reissued by his son Charles I. The purpose of the book was to spell out what "sports" were allowable on the Sabbath. Puritans, of course, did not allow anything on the Sabbath, except going to church. Ezekiel convinced his congregation to leave England and sail with him to Massachusetts, where they would be free to worship in the manner of their choosing. The village of Rowley does not exist today. Twenty local families left England, and emptied the parish of it's residents. Ezekiel and his group sailed from nearby Hull on the ship "The John of London". They landed first in Boston, and then sailed to Salem, where they sought permission from the General Court to start a new plantation. In 1639, the plantation of Rowley was underway. Eziekiel, with most of his original settlers, was joined by about 40 more families in their undertaking. So how do Robert and John Hazeltine fit into this scenario? Did they sail on the John or did they join up with Ezekiel after they arrived in Massachusetts? For starters, there is no ship manifest of passengers for "The John of London", so there is no way to prove they were on board. Their lives were rather ordinary, so nothing much is recorded about them. If they ever discussed where they were from, it was not written down. There was, however, a family named Haseltine which lived in a village rather close to Rowley, Yorkshire, called Knedlington. A Robert Haseltine of Knedlington had at least four sons baptized in the nearby village of Howden, they were: Edward (6 Feb. 1608), Robert (2 Jan 1610, John (23 Aug. 1612) and George (23 March 1613). These baptisms can be found in the Howden parish register. Robert Sr. is said to be the son of Edward Hesseltine, b. 2-22-1582. He married Joanna Swanne of Gilberdyke at the parish church of Eastrington in 1609. I have not seen the documentation for these names and dates, but am hoping to find some kind of confirmation. WARNING:This is in no way proof of any kind, it is only a possibility! Anyway, Robert and John Hazeltine, whether on the John or not, arrived in Massachusetts by 1639 and are among the first settlers of the new plantation of Rowley, Massachusetts. Robert and John were farmers and everyone knows that a farmer needs a wife. The first recorded marriage in the new town of Rowley was that of Robert Hazeltine and Ann Unknown. They were married on 23 October 1639. Robert and John began the arduous task of clearing land for planting. The brothers were the first settlers, along with William Wild, to clear land along the Merrimack River by 1650. this became known as Rowley Village on the Merrimac and finally as an independent village called Bradford. John would eventually cross the river and finally settle in Haverhill, MA. In 1652 the town of Rowley gave Robert, John and William Wild 40 acres of upland each and each was to have commons for 20 head of cattle to fence in if they wanted and 20 acres of meadow land. They were allowed to fell trees for pipe staves, firewood, timber to build houses and fences. They were given the right to keep swine. They would also be freed from paying taxes to the town for the space of seven years. In return Robert, John and William would be in charge of the towns cattle herd. When enough families had settled in Rowley Village, the settlers petitioned the General Court, asking to be incorporated into their own town. In 1668 the Court agreed to their petition provided they hire an orthodox minister and be able to pay his rate. The Bradford men seem to have already anticipated this and had hired their minister. John Hazeltine had donated an acre of his land to be used for a meeting house. At a town meeting in 1670 Robert Hazeltine and his son-in-law Benjamin Kimball were appointed to a committee charged with setting up and furnishing said meeting house. In 1671 Robert was given the authority to call and require men to work on the meeting house. A list of the first church members includes the names of Robert Hazeltine's family. Robert is mentioned several times in the records of the Essex Quarterly Court. If you have never read the records they are actually pretty entertaining. Those naughty puritans! Anyway, Robert served on several juries, and was ordered to keep a ferry for crossing the river. One case of interest, in which Robert was called as witness, involved a man named Robert Swan. The case is very confusing and involves a cow, which is claimed by various men as their own. Anyway, Robert Swan is asked why he did not go to "his cousins" the Hazeltines. This wording might mean anything or nothing, but it reinforces the idea of a connection with Yorkshire, as Robert's mother was supposedly Joanna Swanne. 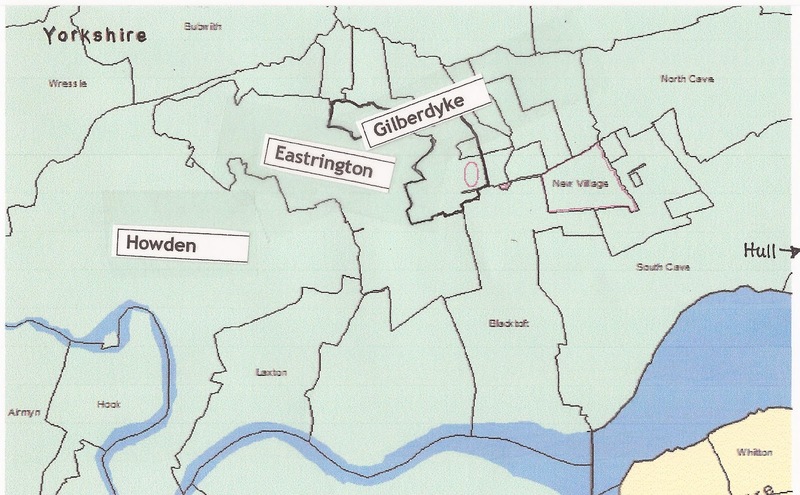 Many ancestry trees have Richard Swan of Rowley as coming from Gilberdyke. Again, I have not seen any of the actual records which support this claim. John Hazeltine married a few years after his brother, his wife was Joan Auter (Anter). In the book "Genealogical and Family History of the State of Maine", George Thomas Little, stated that Joan was from Biddeford, England. She came as a servant to the Holman family. Many family researchers have glommed onto the name Biddeford, which is in Devon. Many, many websites and ancestry tree say that the Hazelton's are from Biddeford, but if the evidence that they are from Howden is not enough to be called proof, then there is certainly nothing that I have seen that would lead me to believe that they were from Devon. This map shows the area where the Hazetines and the Swans are from. Before they died, Robert and Ann buried three of their small children. Robert died in Bradford on 27 Aug 1674 and Ann on 26 Aug 1684. I have seen Ann's date of death attributed to Joanna Swanne Hazeltine. I'm not sure why that is, but I do not believe that she left England. England, Births and Christenings, 1538-1975," index, FamilySearch (https://familysearch.org/pal:/MM9.1.1/JW6T-CYK : accessed 20 May 2012), Robert Haseltine, 1610. A perusal of the web and ancestry.com for the genealogy of Roger Shaw of Cambridge and Hampton reveals a mishmash of bad research or a complete lack of research and a lot of what I call "copy and paste" genealogy. Extensive and exhaustive research was done by Edgar Joseph Shaw which he compiled in his article "The English Origins of Roger and Ann Shaw of Cambridge, Massachusetts and Hampton, New Hampshire". This article was published in the New England Historical and Genealogical Register in 2004. Many genealogies use the book "Shaw Records: A Memorial of Roger Shaw" by Harriette F. Farwell as the basis of their information. This book is full of errors, some almost laughable. I especially love the claim that he received a grant of land from King Charles II on 15 November 1647. If you don't get it you'll have to look it up yourself. According to most family trees available on the internet Roger was born in London to a Ralph Shaw, past researchers used the fact that he was never again mentioned in any record in England as proof of his departure for New England. If he was in fact born in London in 1594 and arrived in Massachusetts in 1638, he lived 44 years in London with no records of marriage or children. This seems unlikely to me and I would not think it compelling evidence that this was Roger the immigrant. According to the research done by Edgar J. Shaw, Roger Shaw was born in Cheshire, England around the village of Congleton in about the year 1600. The parish register at St. James Church in Gawsworth list the baptisms of Roger Shaw's first children. The mother was not mentioned. The entries for the baptism of Margaret, Mary, Ann and Joseph can be found in a search of the Family Search website. I found this interesting bit about Congleton on Wikipedia: During the Civil War, former Congleton mayor and lawyer, John Bradshaw, became president of the court which sent Charles I to be beheaded in 1649. His signature as Attorney General was the first on the king's death warrant. There is a plaque commemorating him on Bradshaw House in Lawton Street. Almost opposite the town hall, the White Lion public house bears a blue plaque, placed by the Congleton Civic Society, which reads: "The White Lion, built 16-17th century. Said to have housed the attorney's office where John Bradshaw, regicide, served his articles. In his article Shaw also discusses his research into the parents of Roger Shaw. Based on a search of the probate records found in the Archdeconary Court of Chester, he was able to pinpoint the parents of Roger to Roger and Margery Shaw of Astbury and Hulme Walfield, and also identify a brother, Humphrey. In his will, Roger Sr. left his estate to his two sons, Roger and Humphrey, and in Humphrey's will of 1652 he left the land be bought of his brother Roger Shaw to one of his sons. Roger and his family arrived in the Massachusetts Bay Colony sometime prior to the fourth month of 1638 when his daughter Ester's birth was recorded at Cambridge, Massachusetts. On 14 March 1638/9 he was made a Freeman of the Colony, which meant he had also become a member of the Church. Roger jumped right into the running of the town and the new Colony, then less than ten years old. He was a selectman for Cambridge in 1641,42,44, and 45. Roger was chosen Cambridge Town Clerk in 1642. According to the book the History of Cambridge "he bought a house and land on the southerly side of Arrow Street". Arrow Street still exists in Cambridge. His daughter Mary, born in Gawsworth, died in Cambridge in 1639, but another daughter Mary was born in 1645. Roger's wife Ann died sometime after this birth and his remove to Hampton where Roger was assigned a seat in the meeting house and no wife was named, but a seat was saved for a future Mrs. Shaw. Roger's name crops up occasionally in the Records of both the General Court of the Colony and the Quarterly Courts of Essex County. the first mention of Roger Shaw in the General Court's records was in 1639 when he was a juror in the trial of Marmaduke Percy, who was accused of beating his apprentice to death. Marmaduke got off, apparently the poor boy deserved the beating. On 15 Nov 1647 (the date from earlier in the article) Roger bought an estate in the town of Hampton from John Crosse, Sr. for 101.15 pounds. The estate included houses, grounds, marsh, meadow, swamp, upland and commonage. Roger was not one of the original petitioners for the formation of the plantation of Hampton. That petition was presented to the General Court on 6 September 1638 and headed by the Reverend Stephen Bachiler. As he did in Cambridge, John was immediately active in service to the town of Hampton. He served as Deputy to the General Court, as Constable, he was appointed to end small causes, and served on both petit jury and the grand jury. It is also widely stated that Roger was given permission by the General Court to operate an "Ordinary" in Hampton. An ordinary was where you sold alcohol. I have read through all the records of the General Court and the Quarterly Courts and cannot find any mention of this action. The fact that he was supposed to be operating an ordinary was given as further proof that he was the Roger Shaw of London, son of Ralph, who was a vintner. In 1653 Roger remarried to Susanna, widow of William Tilton. In a prenuptial agreement, he agreed to take care of her sons by her first husband. Unfortunately, she died the following year. Roger did not marry again. He died in Hampton on 29 May 1661. Joseph married Elizabeth Partridge daughter of William and Ann Spicer Partridge. If you think I have made any errors in this article please comment and let me know, especially the bit about Roger running an ordinary. "England,Cheshire Bishop's Transcripts, 1598-1900," index, FamilySearch (https://familysearch.org/pal:/MM9.1.1/N4RG-L9Z : accessed 12 May 2012), Joseph Shaw, 1635. John Cram was an early immigrant to the Massachusetts Bay Colony, he and his wife Ester arrived in Boston in 1635. He was baptized in Bilsby, Lincolnshire, England on 29 Jan 1596/7. John was the son of Thomas Cram and his wife Jane. The Crams had been in the Bilsby-Alford area for many years and John's ancestry can be traced in the Bishop's Transcripts to his paternal grandfather John Cram, b. about 1540. His father Thomas was born about 1593 and died by 30 March 1639 when his will was proved. John's mother Jane had died in 1612 and was buried in Bilsby. John was one of eight children, the only one to come to Massachusetts. John and Ester were married in Bilsby on 8 June 1624. The first four of their children were born in Bilsby or nearby Farlsthorpe and the last four in New England. The impetus for their move to America was almost certainly the Puritan Minister the Reverend John Wheelwright. Reverend Wheelwright was the vicar at Bilsby from 1623 until 1633. He was a controversial figure who played an important role in both the religious and political life of the new colony. Many of his English Parishioners followed him to America, including the Crams. Muddy river, now known as Brookline, was the first home of the Cram Family. At the January meeting of the General Court, John was give 16 acres of land. The Colony was only in its fifth year when the Crams set up house and began the arduous task of farming on uncleared land. Things did not always run smoothly in the new Colony and by 1637 trouble of a religious nature was brewing in Boston. Anne Hutchinson, related by marriage to Reverend Wheelwright, was at the center of an affair known as the Antimonian Controversy. The dogma of the Puritan Church was not a hard and fast set of beliefs, but anyone who preached anything outside the mainstream came under fire, and when it was a woman doing the preaching, the Colony was sure to crack down. Anne was tried, found guilty and she and John Wheelwright were thrown out of the colony. The Reverend Wheelwright and his followers left Massachusetts and established the town of Exeter in 1638. Exeter was in New Hampshire. Anne and her family went to New York, where she was killed by Indians in 1643. Combination for government at Exeter, with the forms of oaths for rulers and people. Whereas it hath pleased the Lord to move the heart of our dread Sovereign Charles by the grace of God, King of England, Scotland, France & Ireland, to grant license & liberty to sundry of his subjects to grant themselves in the western parts of America - We his loyal subjects, brethren of the church in Ecceter, situate and lying upon the river Pascataquacke with other inhabitants there, considering with ourselves the holy will of God and our own necessity, that we should not live without wholesome laws and government among us, of which we are altogether destitute, do in the name of Christ and in the sight of God combine ourselves together to erect and set up amongst us such government as shall be to our best discerning agreeable to the will of God professing ourselves subjects to our Sovereign Lord King Charles, according to the liberties of our English colony of the Massachusetts, and binding ourselves solemnly by the grace and help of Christ, and in his name and fear, to submit ourselves to such godly and christian laws as are established in the realm of England to our best knowledge, and to all other such laws which shall upon good grounds be made and enacted amongst us according to God, that we may live quietly & peacably together in all godliness and honesty. Mo. 5 D. 4, 1639. In the first division of land, John was allotted 8 acres and 16 poles of upland. In 1643 he was one of the townsmen who signed the petition requesting to come under the authority of the Massachusetts Bay Colony. Exeter was the last of the four New Hampshire towns to do so. He was given land in 1645 and 1648 He served as a townsman in 1648 and 1649. Also in 1648, his 15 year old son, Joseph, drowned, and his last child, Lydia was born. The Reverend Wheelwright left Exeter by 1641, and moved to Wells, Maine, as the Massachusetts Bay Colony was starting to take control of New Hampshire, and he was still in hot water with Governor Winthrop. He would eventually be pardoned by John Winthrop and allowed back into Massachusetts. The Crams did not follow him to Maine. John Cram made a final move to the town of Hampton, New Hampshire. He lived in the area that would be known as Hampton Falls. He and his wife must have been good upstanding Puritans as they became church members in full. John died there on March 5th, 1681 age 85. His wife Ester died in Hampton 16 May 1677. John Wheelwright returned to England in 1656 for about six years. He went to college with Oliver Cromwell and was well received by him. After Cromwell's death and the return of the Monarchy, Wheelwright once again sailed for Massachusetts and lived his final years in Salisbury, Massachusetts. 1.Sarah, born September 19, 1663, unmarried in 1707. 2.John, born April 6, 1665, married Mary; had seven children: Argentine, Abigail, Benjamin, Wadleigh, Jonathan, John, and Mary. 4. Mary, born August 6, 1669. 5. Joseph, born April 12, 1671; married Jane Philbrick, May, 1700. Their children were: (1) Comfort, born April 16, 1701; (2) Abigail, born August 7, 1710. 6. Hannah, born August 22, 1673; married William Fifield, October 26, 1693. 7. Esther, born October 16, 1675, not married in 1707. 8. Jonathan, born April 26, 1678; died, unmarried, December 3, 1703. 9. Elizabeth, born January 3,1780- 81; married Samuel Melcher, May 16, 1700. Benjamin Sr. wrote his will in 1707, he named all his children, except Jonathan, who died in 1703. He added a codicil two months after writing the original will in which he requested that Benjamin Jr. provide housing for his two unmarried sisters until such time as they married. He did not name his wife, Argentine, or make any provision for her care, so I believe that she was already dead. Benjamin's will was proved on Dec 5, 1711, he died sometime between it's writing and the date it was proved. Benjamin Sr. left all his land and cattle to his son Benjamin Jr. Benjamin was born in 1666 and married in 1699 Sarah Shaw of Hampton. Sarah was the daughter of Joseph Shaw and Elizabeth Partridge, grand daughter of William and Ann Spicer Partridge. Not much is written about Benjamin Cram Jr.
Robert Charles Anderson. The Great Migration Begins: Immigrants to New England, 1620-1633. Vol. 1-3. Boston, MA, USA: New England Historic Genealogical Society, 1995. Charles Henry Bell. The History of Exeter, New Hampshire, Boston, MA, 1888. Lake City, Utah: Genealogical Society of Utah, 1966). Sarah Norris, the mother of Katherine Baker Thornton was descended from Nicolas Norris of Hampton and Exeter, New Hampshire. Nicholas does not appear in any records until his marriage in 1663/4 to Sarah Coxe, daughter of Moses Coxe and his wife Alice. Nothing is known about his (Nicolas) parents, DOB or place of birth. There is some speculation on ancestry.com and other sources, both web and old reference books, that he was from Ireland but of English descent, but the push of Irish immigration didn't really get going until after the restoration of the monarchy in England. He was probably born around 1640. He is also said to be a tailor and a planter. It is not known when he arrived in Hampton, some sources suggest he was there by 1654. Moses Coxe was one of the first settlers in Hampton, he received land there in 1640. He was also the first Herdsman in Hampton, responsible for the care of all the cattle in the town. In 1668 he conveyed land to another settler, the land was bounded by land owned by Nicolas Norris. Not much is known about Moses Coxe, he died in 1687, he left Sarah and her sister 5 shillings. Nicholas married Sarah in 1663/4 in Hampton, New Hampshire. His property in Hampton was modest: a house on about three acres and a planting field of about six acres. Two years later sold his land in Hampton and made the move to Exeter. Exeter was founded in 1638, so by the time he moved his family, it was fairly well established. In 1667 he took the oath of allegiance, required of all males in the Colony. He began to acquire more land, he was given 100 acres in 1681, 3 acres in 1698, 20 acres in 1705 and in 1720/1 a further 10 acres and finally in 1725 the last recording of his name he was granted 30 acres. His house was near the meeting house in Exeter Village. Nicholas is first mentioned in the Exeter records when it was ordered than no logs could be laid down on meeting house hill near his house, as they impeded the highway. Nicholas was also required to serve in the militia, he was a soldier in King Phillips War in 1670. In 1689 he signed the New Hampshire Petition. This was a request from the residents of New Hampshire to the Government of the Massachusetts Bay Colony, the settlers were unable to adequately protect themselves from Indian attacks and asked to be Governed by Massachusetts. Moses 14 Aug 1670, Exeter d.
If Nicholas was born in 1640 and died sometime after 1725, he was at least 85 when he died, a great age at that time. Moses Norris was born on 14 August 1670, he spent his entire life in Exeter. He married 4 March 1692 Ruth Folsom, daughter of Samuel and Mary Roby Folsom of Exeter. Moses, like his father, served as a soldier, he was on active duty 31 August until 28 September 1696. This was during King William's War, the first of the four French and Indian Wars. Moses was given land from his father, father in law, and was granted land in Exeter. On Feb. 3, 1698 he was given 30 acres. 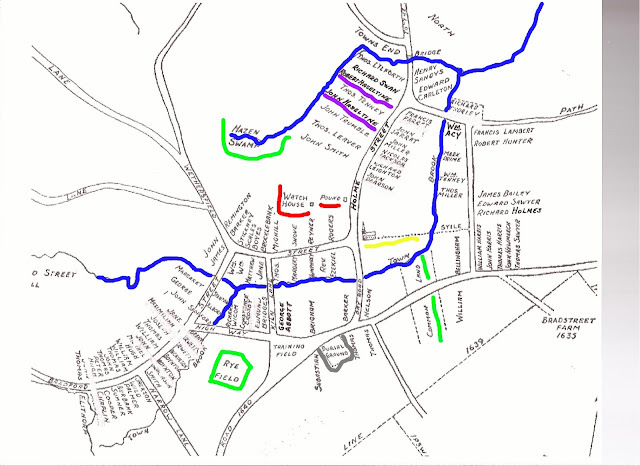 His father first gave his 16 acres of land on the road to Hampton Farms and on the same day Samuel Roby deeded him land. He was again granted land in Exeter in 1706, this time a grant of 50 acres. The last recording of his name was in 1725 when he was given an additional 50 acres. An interesting note about Joseph and James. Charges were brought against their wives for being Quakers, this happened in 1753. they were both found guilty and paid a fine of 5 shillings. Jonathan Norris was born in Exeter about 1699. He married Sarah, the daughter of Benjamin and Sarah Partridge Cram of Exeter. In 1720/21 Moses deeded several acres of land to Jonathan and a share in a saw mill Petuckaway (Epping, N.H). He sold his share in the mill to his brother James in June of 1741. Like his father and grandfather Jonathan served in the militia, in 1745 he served as a soldier in the siege of Louisbourg, Cape Breton Island and in 1755 as a Sergeant in the expedition against Crown Point. Jonathan was not only a land owner but also ran both a sawmill and a gristmill.